There are two ways to use your Apple TV device to watch events on Livestream. The Livestream app for Apple TV is available for download from the App Store on Apple TV 4th generation and higher. Once you install the app, there is no need to log in. 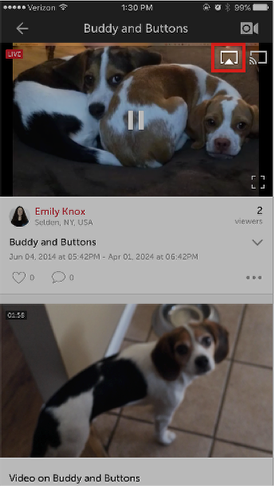 You will find all featured content and categorized content immediately on the main screen. Use the Apple TV remote to navigate the app. If you are looking for a specific event, there is a search function in the upper-right corner of the main screen. Selecting any live event will open a live preview. Click the Watch button to watch the event in full screen. You can also watch any events that are available on demand. Please note that any events that are password protect or privatized in any way will not appear in the Livestream tvOS app. We also offer a workaround for viewing with Apple TV via Apple AirPlay. Apple provides information here on which generations of iOS and Apple TV devices support this feature. First, be sure your Apple TV and iOS device are connected to the same WiFi network. Launch the Livestream app on your iOS device and log in to your Livestream account. 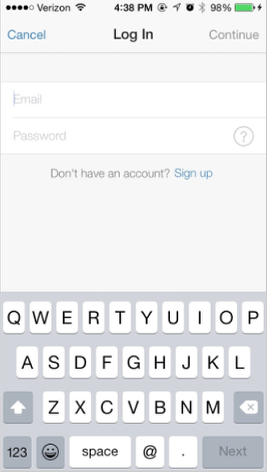 If you do not have an account, select Continue with Email, then Sign up to create an account. Once you are logged in, navigate to the event you want to watch. 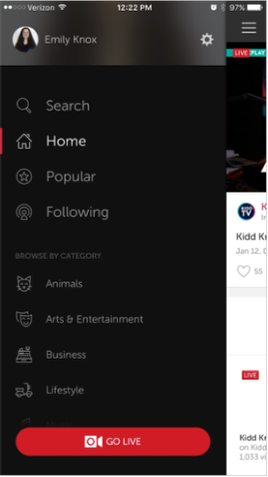 You can do this by tapping the navigation menu icon in the upper-right corner, and select Search, Home, Following, or Popular. When you navigate to the event and see the stream playing back, tap the player and you will see the AirPlay logo in the upper right corner. Tap the logo and your Apple TV will appear as an option in the menu that pops up. 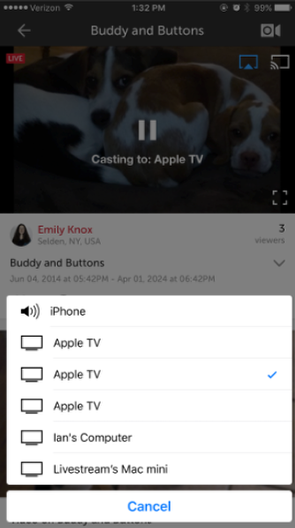 Select your Apple TV, and the stream will send to your TV in seconds. Please note the quality of the stream is dependent on what bitrate the producer is sending it and the speed of your Wi-Fi connection.